2,200 biographies with pictures of Second Wave Activism. 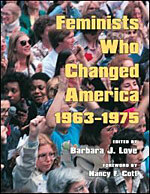 Barbara J. Love’s Feminists Who Changed America 1963-1975 is the first comprehensive directory to document many of the founders and leaders (including both well-known and grassroots organizers) of the second wave women’s movement. It tells the stories of more than two thousand individual women and a few notable men who together reignited the women’s movement and made permanent changes to entrenched customs and laws. Order now and pay for your books with PayPal or credit card. If you prefer to pay for your books by check, please make payable to “Veteran Feminists of America”. AVAILABLE AT LAST ON CD! At last, an irreplaceable CD on women’s issues! 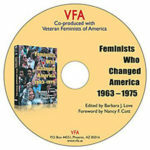 Feminists Who Changed America, currently in its fourth printing with University of Illinois Press, can now be obtained in CD form from its co-publisher Veteran Feminists of America. A keyword search now gives you instant access to first-person reports on hundreds of subjects, such as laws, lawsuits, companies, unions, cities and states, government officials, schools and universities, sexual harassment, violence, people having abortions, lesbians, race discrimination, teachers, arrests, etc. Current owners of the book will want to add this easy-to-research computer version. New purchasers will also enjoy the biographies of 2200 women and men who created the modern women’s movement, with exciting life stories using their own words. “Works like a charm!” says Sherrill Redmon, director of the Smith College Collection. An invaluable resource, a fascinating read. Order now and pay for your CDs with PayPal or credit card. If you prefer to pay for your CDs by check, please make payable to “Veteran Feminists of America”. Buyer Beware! You are about to fall in love with a feminist. Turn the page and another will become irresistible. Feminists Who Changed America, 1963 – 1975 will change YOU. This is a dazzling compendium of over 2,000 biographies; elegant, short, profound and inspiring. Unlike the lost legacies of many First Wave feminists, the stories of these Second Wave feminists will be preserved forever in this collated, verified and beautifully presented book. In addition, each feminist’s archive site is indicated. The three year creative process began with identifying and locating feminists who were active 1963 ~ 1975. They (or their heirs) were sent questionnaires and their responses were transformed into short bios. You can be certain of the veracity of the information here but don’t think for a moment that it is dry or exclusively academic. With each biography you will fall in love with a feminist who was a first; first lawmaker, first professor, first publisher, first judge, first member in a legislature, first to march, first to open women’s health clinic. In this reading you will read and feel how these brief years paved every road for women in America and, thus, women in the world. It is rich as cheesecake, a bite every day is delectable.